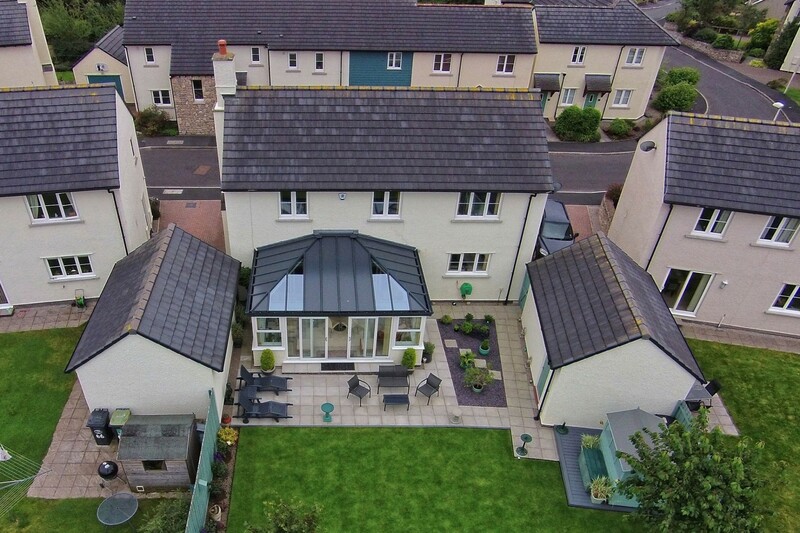 With U-Values as low as 0.16, Livinroof combines solid roof panels and shaped glazing to create stunning roof designs in any conceivable shape or size. 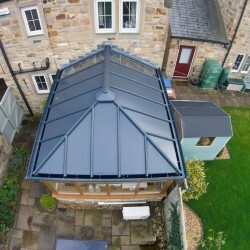 Based on Classic roof, Livinroof is familiar to surveyors and fitters and simple to install. 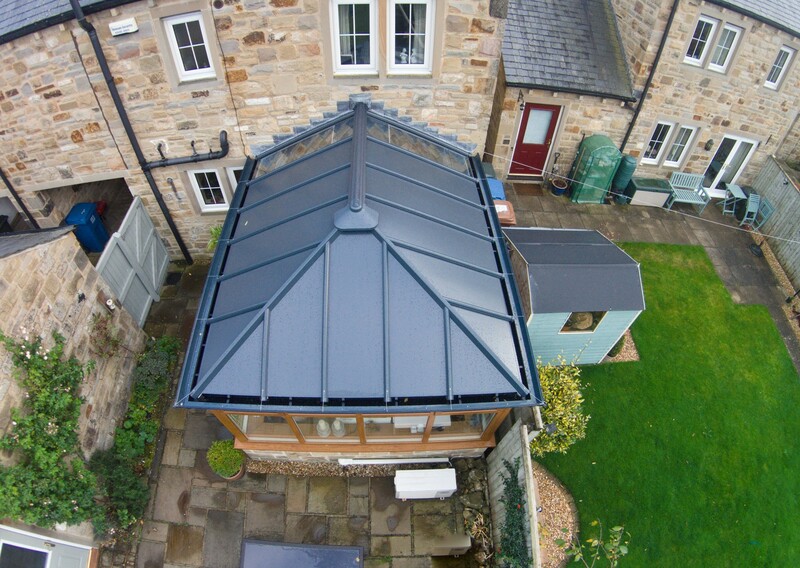 Available in almost any shape or size, the Livinroof is the only solid roof to go as low as 5° pitch, perfect for low pitch lean-to’s. At no extra cost, glass panels can be integrated virtually anywhere into the design giving natural light where needed. 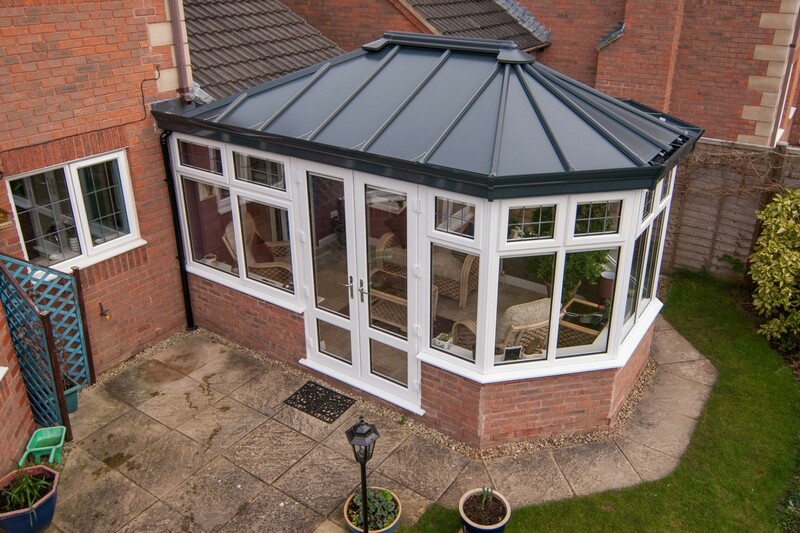 Weighing in at 31kg/m2, Livinroof is ideal for replacing any shaped conservatory roof on existing window frames. The fully fire tested Livinroof comes with aluminium or U-tec external panels so you can offer a price point that suits all. Weighs only 36kg/m² lighter than any other solid roof. 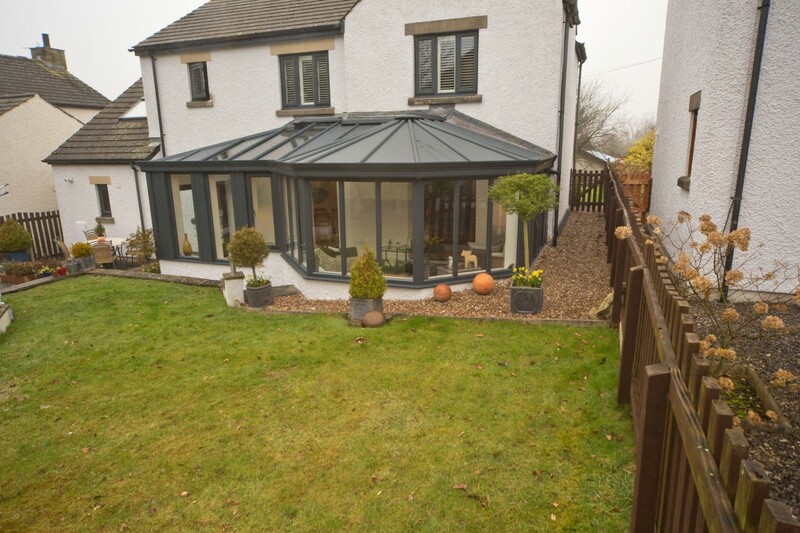 Designed by conservatory specialists, Ultraframe to replace existing conservatory roofs. The only solid replacement solution for low pitched lean-to's with pitches from 5 to 44°. Advanced software to instantly validate structural requirements of any complex designs. 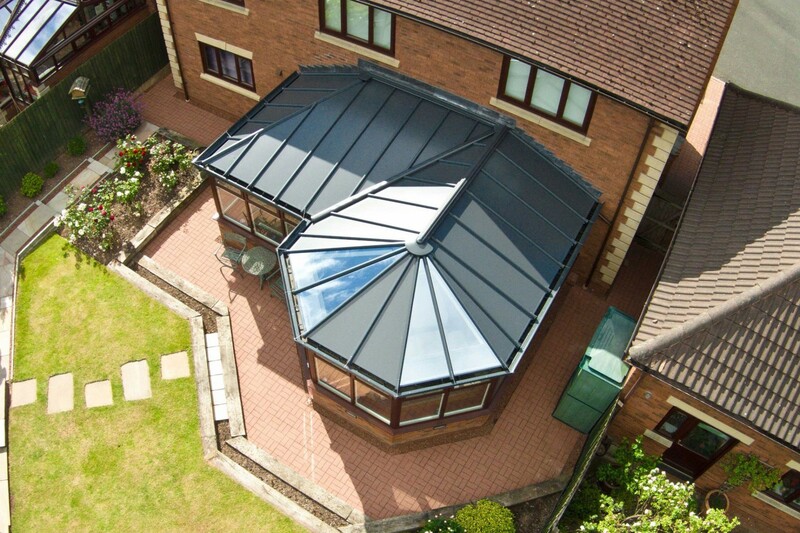 Shaped glazing inserted anywhere in the roof at no extra cost. Shaped glazing for a bespoke and stunning internal design. Highly configurable glazed panels for natural light where needed. U-Value as low as 0.16. Thermally insulated internal pelmet as standard. The complete, assembled Livinroof structure was fire tested in 2017 by Warringtonfire. Livinroof is fire rated as B-roof according to EN13501-5: 2016. Livinroof is fire rated as AA according to BS476-3:2004. 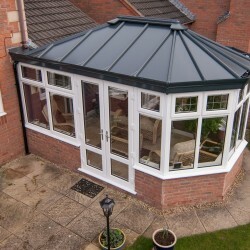 The Livinroof solid roof is purposely designed for the replacement of tired glazed conservatory roofs. Externally, it uses the familiar Classic roof painted in RAL7016 urban grey and glazed with insulated panels. Internally, it uses two separate insulation layers (provided). At the eaves, the insulated internal pelmet engineered steelwork ladder system is used - all internal roof surfaces are then plasterboarded (See below for specification, not supplied) before being plaster skimmed. The Livinroof solid roof is a cost effective, simple to fit pre-packaged solid roof kit that is aimed at the replacement of tired conservatory roofs. Glass panels and shaped glazing can be integrated to maintain light into any adjacent room – no additional cost to swap solid panels for high performance glazing. Create stunning designs unlike any other. 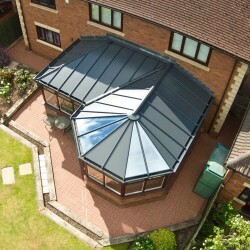 A pre-packaged solid roof that can be configured to suit virtually any existing conservatory roof. It can also be fitted with variable pitches and differential pitches without problem. Livinroof is based on BBA certified Classic roof chassis, the first glazed roof with this important third party accreditation and the only solid roof replacement product based on a BBA certified platform. LABC Registered Details demonstrate compliance with Building Regulations. Ultraframe has partnered with JHAI: Approved Building Control Inspectors. In England, and Wales, they can undertake Building Regulation inspections for a uniform approach across all localities. See separate brochure for JHAI information and application form. U value of 0.16 W/m2K – warm solid roof, vaulted ceiling. Insulated internal pelmet system set at 300mm projection (ability to vary projection too), better finishing detail at eaves and perfect for cables and lights. Glass panels can be integrated to maintain light into any adjacent room – no additional cost to swap solid roof panels for high performance glazing. Everything is pre-fabricated in our highly efficient factory to ensure rapid fit on site. On a 4m x 4m Georgian, the system weight is 31kg/M² including plasterboard (12kg/m2 polycarbonate roof and 30kg for a glass roof). 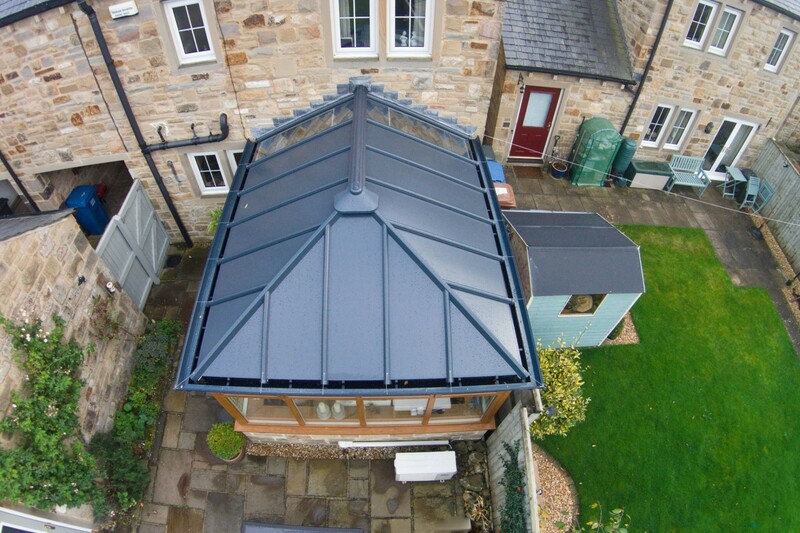 The Livinroof solid roof has a 0.18 U Value, which is 15 times more thermally efficient than a 16mm polycarbonate or older glass roof without solar control. The room will be cooler in the summer and warmer in the winter. Heating costs will be reduced. The room can be used 365 days of the year. 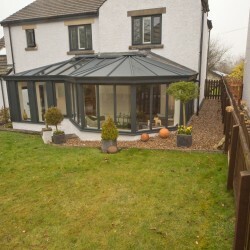 It is worth offering the homeowner the options of new frames, since modern glazing specifications will complement the thermal performance of the roof. In turn, this makes the room more comfortable & cheaper to heat. Building Regulation compliance is required for solid roof conversions and new build extensions. 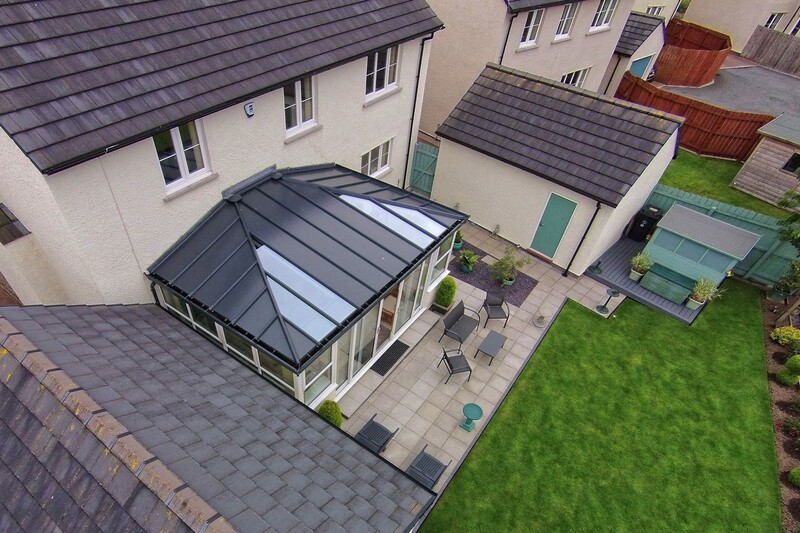 The Ultraframe JHAI partnership provides peace of mind regarding the performance of the roof, ensuring that there are no problems with compliance when the homeowner decides to sell their home. JHAI provides a low cost, consistent way of complying with Building Regulations across England and Wales in a practical, pragmatic approach. 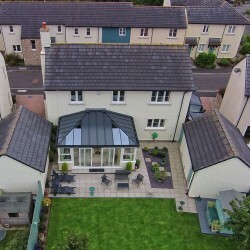 Livinroof is supplied in RAL7016 Urban Grey as standard. When installed it looks very similar to the appearance of a subtle blue glass roof, reflecting the sky. It is less likely to show the dirt whereas other colours may. Livinroof has a system weight of 31kg/m2 (including plasterboard) – much lighter than other replacement roofs. Whilst around the same weight as a glass roof, this solid roof often enables the original window frames to be used. This provides a saving to the homeowner if required. The difference in loading on the foundations is negligible. Provided there is no sign of settlement in the base there is no need to excavate a pilot hole to reveal the foundations. Please consult JHAI if you are in any doubt. Livinroof is offered with a black Marley Classic gutter as standard with the option to have one of our powder coated Cornice options. The uPVC gutter option enables homeowners with a tight budget to take advantage of the benefits of the Livinroof solid roof system. Cornice provides the wow factor! 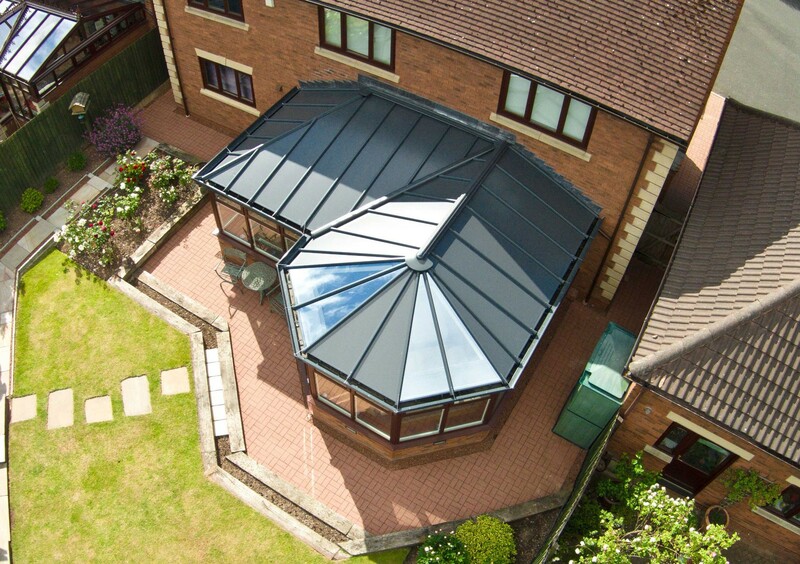 The easy to install system can be specified in grey to match the roof, the same colour as the frames, or in a bespoke colour that complements or contrasts with the frames. This enables the homeowner to be creative and make their mark on their new home improvement project. 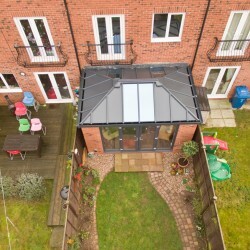 This adds visual appeal to the design of the extension. The homeowner has an individual design that is their own. Take advantage of the sweep of the sun over the extension by choosing which panels to glaze and which to leave solid. This brings light into any room that would otherwise be darker with a solid roof. 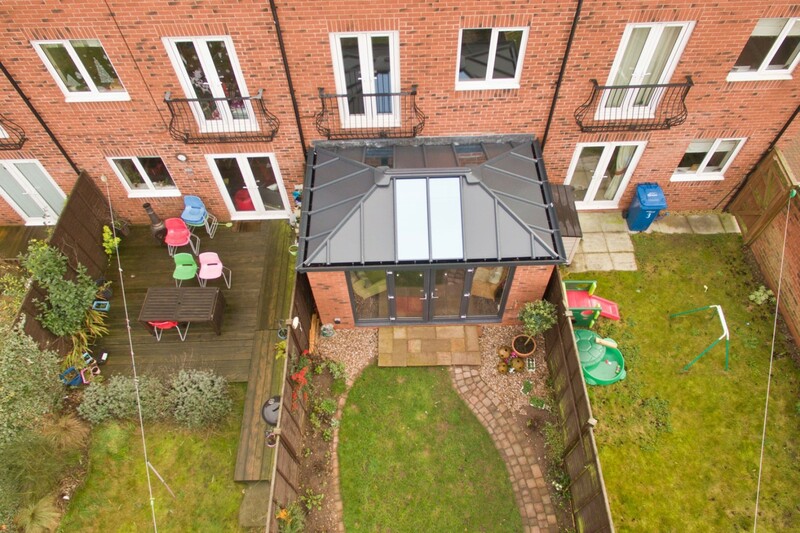 Watch TV in the Livinroof extension without suffering problems with glare, whilst having the benefit of natural light. 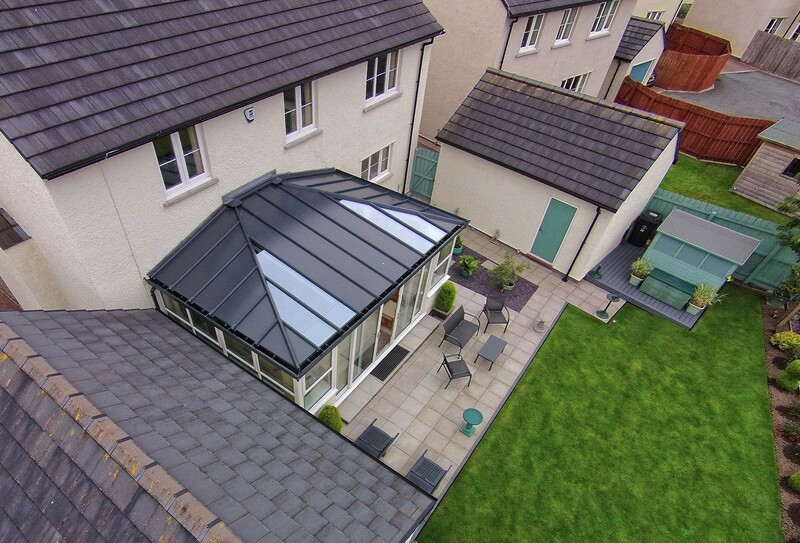 Unlike other solid roofs, the Livinroof brings more light into the adjacent room. This is crucial if you are replacing an old glazed roof. An insulated internal pelmet is part of the design, with a horizontal soffit inside the extension. The standard projection of the insulated internal pelmet is 300mm but it can be varied, (with a max up to 1200mm). You can put the downlights of choice within the insulated internal pelmet around the perimeter of the extension, providing attractive mood lighting. You can fit speakers to the insulated internal pelmet with hidden cables led through to your amplifier, which should be considered for first-fix cabling. Livinroof has a vaulted ceiling and a plastered finish. The vaulted ceiling provides a light spacious feel to the extension. The plasterboard finish makes the extension feel as though it is part of the house. It can be integrated with super-insulated columns to improve thermal performance, provide visual appeal and reduce build times. 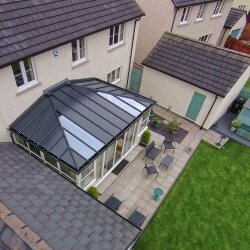 Livinroof is based on the Ultraframe Classic BBA certified platform and carries a 10 year guarantee. This solid roof has a proven pedigree and will provide comfort and peace of mind for the homeowner for many years to come. The Classic system enables variable pitches to be specified, useful when height restriction apply, including the ability to produce lean-to designs as low as 5 degrees. Fitters are familiar with the system, so a speedy swap from old to new with no risk of damaging existing floors/finishes. Create a simple plastered ‘flat top’ at the apex to suspend lights from. 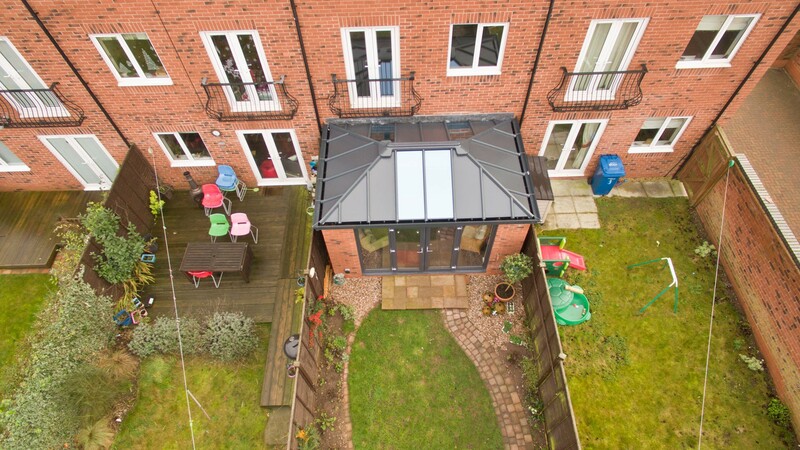 Adds further visual identity to the extension roof internally.